Last month (or eons ago, which is what it feels like) my sister decided to make jam. She was here to stay after I had surgery, and it just so happened that it was strawberry season. We had strawberries with almost every meal, and Sarah was always going out to buy more at one or several of the local farm stands. One time she came home with the ingredients for freezer jam, along with about five quarts of ripe berries (I won’t link because the recipe is on the back of every Sure Jell or Certo package, and every third blogger made strawberry jam this year). So now, thanks to my sweet sister, I have enough jam in my freezer to last forever, along with bags and bags of frozen whole strawberries. It’s delicious, of course. I like it best on vanilla ice cream, but it’s also the star of every peanut butter and jelly sandwich. 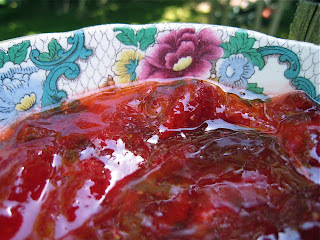 And when it’s cold and dreary this winter, I’ll have Sarah’s strawberry jam to remind me that another June (and another strawberry season) will be here by and by. Oh that looks and sounds so good. With everyone talking about jam this year, even I’m getting the urge to make some. Ahhhh – the comforts of homemade jam.there’s just nothing quite like it. Mouth watering!! I love my strawberry jam on frozen yogurt with a drizle of Hershey’s chocolate sryup. Great sister! Freezer strawberry jam has the freshest taste. My kids really loved to help me make it. I’m glad you have such a sweet and tasty reminder of your sister’s visit. Beautiful picture of it, Jane.